One of the biggest — and strangest — storylines to emerge from spring training has been the Saga of Drake LaRoche. 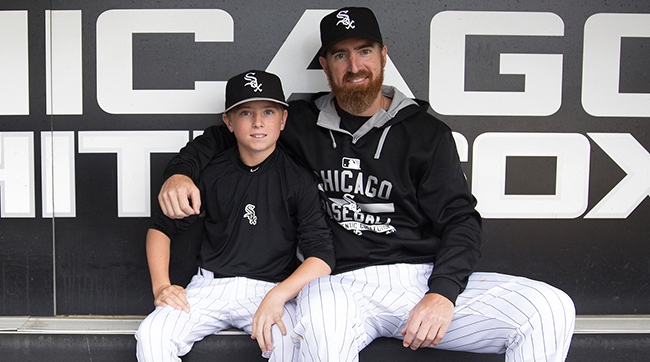 In case you’ve missed it: Chicago White Sox first baseman Adam LaRoche has been bringing his son, Drake, along to games since his days with the Washington Nationals. But Drake doesn’t sit in the stands. He hangs out in the clubhouse and the dugout. He’s on the field during batting practice, shagging fly balls. He even has his own locker. That all continued when LaRoche went to Chicago — until last week. White Sox vice president Kenny Williams asked LaRoche to cut back on how often he brings Drake to work. LaRoche, a 13-year veteran, retired instead. Some of his teammates supported him (and Drake) by hanging the father and son’s jerseys in their lockers. Others made anonymous statements that they felt uncomfortable with Drake hanging around all the time. Every MLB team has its own policy on whether kids should be allowed in the clubhouse. But the Drake LaRoche brouhaha has everyone asking whether kids should be banned or not. So, you tell us: Should kids be allowed in Major League Baseball clubhouses? Should kids be allowed in MLB clubhouses?